OMAHA, Neb. (KMTV) — One of the hardest hit areas by the floods was Fremont. The Regency II Mobile Home Park in Fremont had to be evacuated due to the levee breach. Many of the residents in that park are Hispanic, and say a week later...they still haven't been informed on what's happening with their homes. They blame little information in Spanish from the city...and no information from the park's management. "They went around the park and told people they had to leave, but many of them were at work during that time, so they couldn't really do on that time. So that's why many of them left their belongings at home and by the time they got off work, everything was a mess," said one resident. Many have not been allowed in since last Friday when they were forced to evacuate and say the are not getting a response from the owner or property manager about clean up procedures or damage repairs. They did not want to show their faces during our interview due to fear of retaliation from the park's management. "I've had to go stay in Omaha. They're out of hotel rooms here. And shelters are too crowded, I think even full. And it's urgent to get this addressed because my son starts school again on Monday." Carlos Gonzales said he's anxious to get inside his home to get medicine for his son and wife. "We're running out of options. We need clothes, and they're not letting me in...and my wife is sick because she just gave birth to my daughter last week." The families say they don't have a lot of money and are expecting the park's management to step in to help take care of the flood damage. "We demand they clean the park. Because my daughter's can't return there with the current conditions. Everything is contaminated. It's frustrating. The owner of the Regency hasn't even said, hey we're here for you guys. This is how we're going to help. Or even just information from them and the only info we're getting is from the city's auditorium and it's all in English." 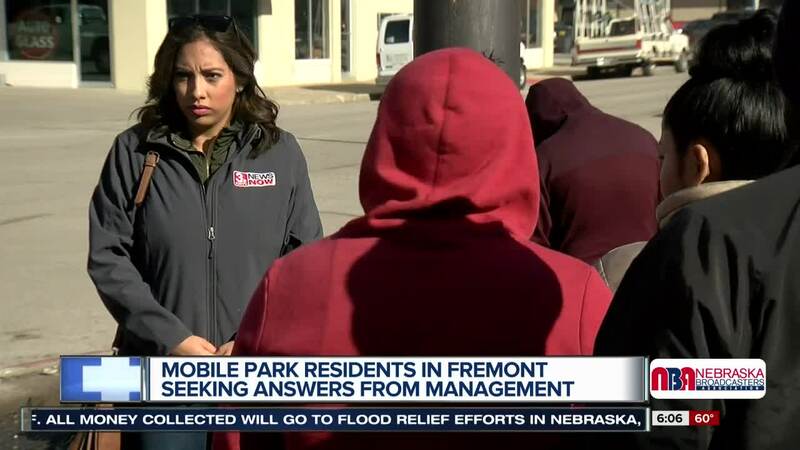 We went to the mobile home park manager for answers. When asked about when residents may get back in, the manager said that the city will need to inspect the mobile homes first and that they don't know who will be responsible for cleanup efforts yet. Today, the city held a press conference in Spanish for residents.